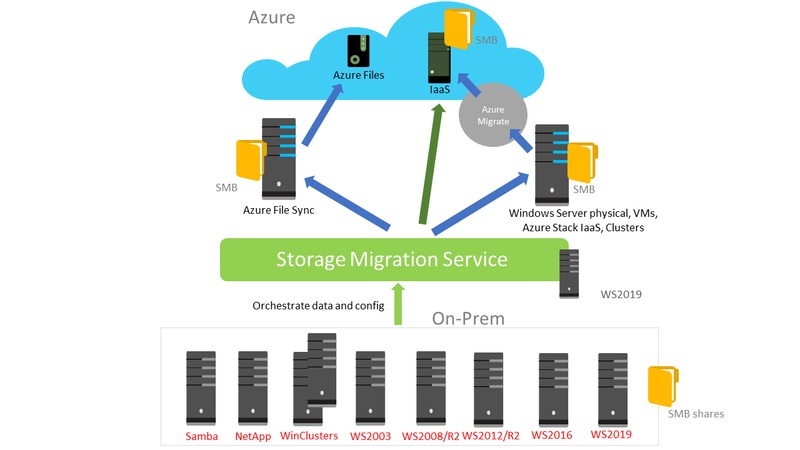 Storage Migration Service makes it easier to migrate servers to a newer version of Windows Server. It provides a graphical tool that inventories data on servers and then transfers the data and configuration to newer servers—all without apps or users having to change anything. This topic discusses why you'd want to use Storage Migration Service, how the migration process works, and what the requirements are for source and destination servers. Inventory servers to gather info about their files and configuration (shown in Figure 2). Transfer (copy) data from the source servers to the destination servers. Cut over to the new servers (optional). The destination servers assume the source servers' former identities so that apps and users don't have to change anything. The source servers enter a maintenance state where they still contain the same files they always have (we never remove files from the source servers) but are unavailable to users and apps. You can then decommission the servers at your convenience. If you're migrating only a few servers and one of the servers is running Windows Server 2019, you can use that as the orchestrator. If you're migrating more servers, we recommend using a separate orchestrator server. A PC or server running Windows Admin Center to run the Storage Migration Service user interface, unless you prefer using PowerShell to manage the migration. The Windows Admin Center and Windows Server 2019 version must both be at least version 1809. We strongly recommend that the orchestrator and destination computers have at least two cores or two vCPUs, and at least 2 GB of memory. Inventory and transfer operations are significantly faster with more processors and memory. A migration account that is an administrator on the source computers. A migration account that is an administrator on the destination computers. The orchestrator computer must have the File and Printer Sharing (SMB-In) firewall rule enabled inbound. 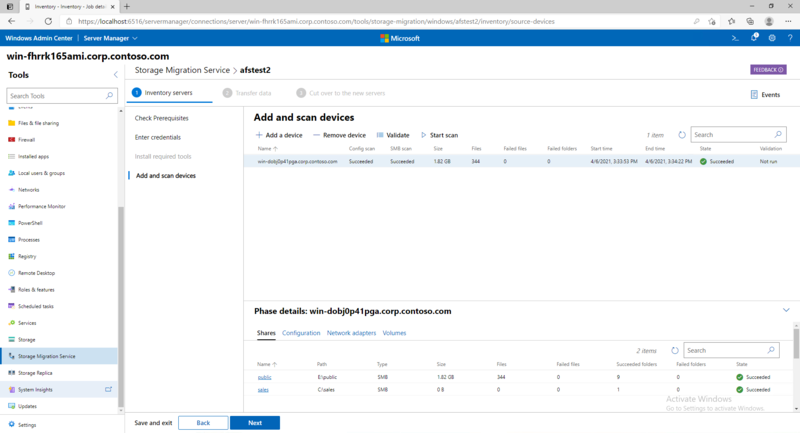 Installing the Storage Migration Service Proxy service on a Windows Server 2019 computer automatically opens the necessary firewall ports on that computer. Destination servers running Windows Server 2019 have double the transfer performance of earlier versions of Windows Server. This performance boost is due to the inclusion of a built-in Storage Migration Service proxy service, which also opens the necessary firewall ports if they're not already open.